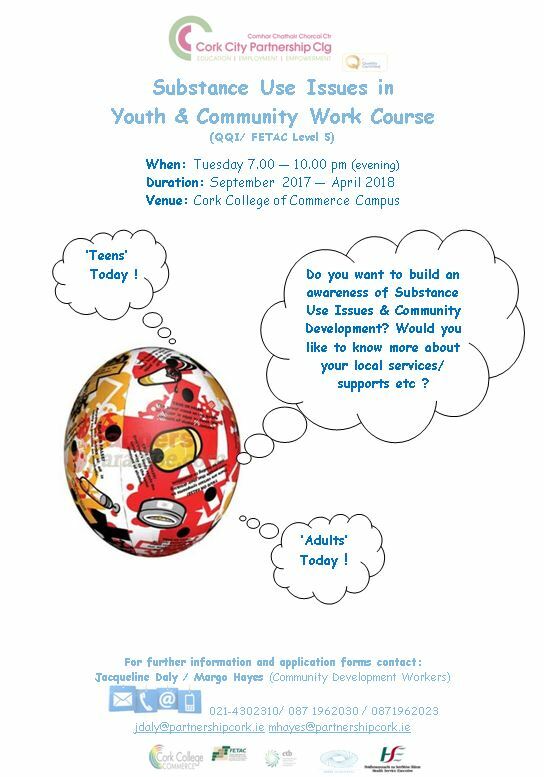 The Substance Use Issues in Youth & Community Work Course 2017/18 -QQI/FETAC Level 5 » Comhar Chathair Chorcai Teo, Cork City Partnership Ltd. 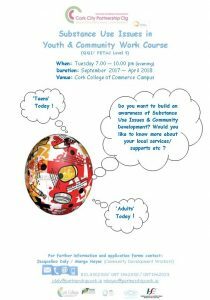 This course is delivered in conjunction with the Cork College of Commerce. This part time evening course is designed to promote good practice among those who work (paid / voluntary positions with young people and in various capacities across communities. It provides a critical perspective on some of the issues including community development and drug / alcohol issues which can affect young people and communities and encourages the development of coherent responses at individual and organisational level. The two components should promote the ability of learners to work safely and effectively in youth and / or community work settings. The programme also aims to provide the participants with the necessary knowledge and skills in sourcing and / or resourcing applicable supports systems, both within and outside their communities. Please take a look at the entry requirements (on the brochure attached) and if you have any questions you can contact me on either the partnership’s landline or on my mobile or by email (details below). The course fee for successful applicants is €125. Please feel free to forward this email to applicable contacts / colleagues etc. and if you are working or liaising with any groups or mentors, I am very open to popping along to go over the course entry details with them. Graduates will receive a QQI /FETAC Level 5 Combined Component Award. Course Modules: (1) Understanding Community Development & (2) Substance Use Issues in Youth & Community Work.